Albert Einstein put it well: being a person of success is not the same as being a person of value. In leading one of our organizations through a decade of growth, my personal definition of leadership success has become clearer thru our focus on values. I now see success as the results we receive when exemplifying our core values in word, thought, and deed. Bob Chapman, CEO of Barry Whemiller is a prominent influencer of my thoughts on leadership success. He has an excellent video on successful leadership. I recommend watching it to better understand the rest of what I write. Almost 4 years ago, I began a journey to lead our management team towards a healthier culture. It has been a difficult journey. Moments of what appeared to be success quickly drowned in the swift currents of failure. In early 2013, I recognized that success is based less on what happens inside of an organization. It is more about what happens outside of an organization. As John Maxwell writes “Leadership is influence”. Since 2013, we have watched our organization’s influence reach far outside of what we do at work each day. Recently several individuals from the front lines of our team shared with me how being a part of our organization has helped them be a better friend, a better father, a better husband, a better leader, and a better person. They shared how becoming an organization that lives out our core values has reached into the homes of our clients and our team members. For me, there is nothing that will ever happen in our organization that will make us more successful than this. Success dwells within the influence we have on others, and the value we help them to see in themselves. That’s not the excellent way – One of our core values is excellence. As I was filling up my coffee cup one day I overheard two co-workers having a discussion on how to do a specific task. After finishing a passionate description of how the task should be done the other person simply asked, “Is that the excellent way of doing it?” It was quiet, then the first person replied, “No” and then immediately pointed out how his own idea could be improved upon. Hearing this interaction showed me that our front line team members were living out our value of excellence. Serving our communities – The final core-value that our management team choose was humility. I cautioned them that they were setting a high bar. They were adamant that this value existed within our team and that they desired to empower our communities thru serving with humility. A few weeks later I experienced our team living this out. We had an organization that approached us requesting a substantial financial donation. I realized that this would push us beyond what we had agreed to for the fiscal year. With some trepidation, I brought the request before our management team. After explaining it, I asked if anyone had any questions. There were no questions and it was unanimously agreed to grant the request. I expressed my thanks to the team and was preparing to close the meeting when our a member of our management team said he had a question regarding the donation. He asked why we were only giving what they asked for when we knew they needed more and we had the ability to give more. They then all agreed to give even more! As I have watched our team in action, they do not think less of themselves, they think of themselves less, and in doing so put the needs of those they serve in our organization as a top priority. This creates a healthy culture that serves our communities. 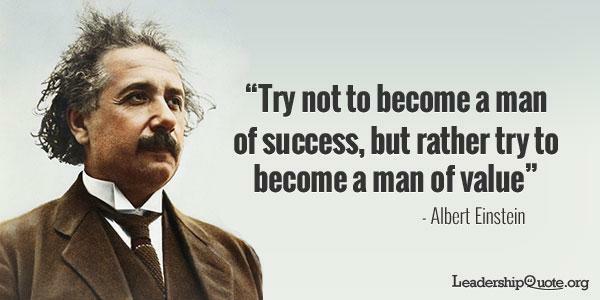 As Albert Einstein reminded us, Let us pursue becoming men and women of value as we humbly lead towards success. May our success always be producing richer relationships that spur us on to build better communities! Learn to lead, and lead to learn.